This section contains images that illustrate the operation of the bviTouch system. bviTouch renders colors in an image into musical tones. There is a different tone for each of the primary screen colors, red, green, and blue. When you place your finger on an image in bviTouch, the colors under your finger are rendered into musical tones, allowing you to explore the image and experience its content. Each image in this section also has a verbal description, along with hints about how to interpret the musical tones. You can stop the vocalization of an images description by a quick tap anywhere on the image. 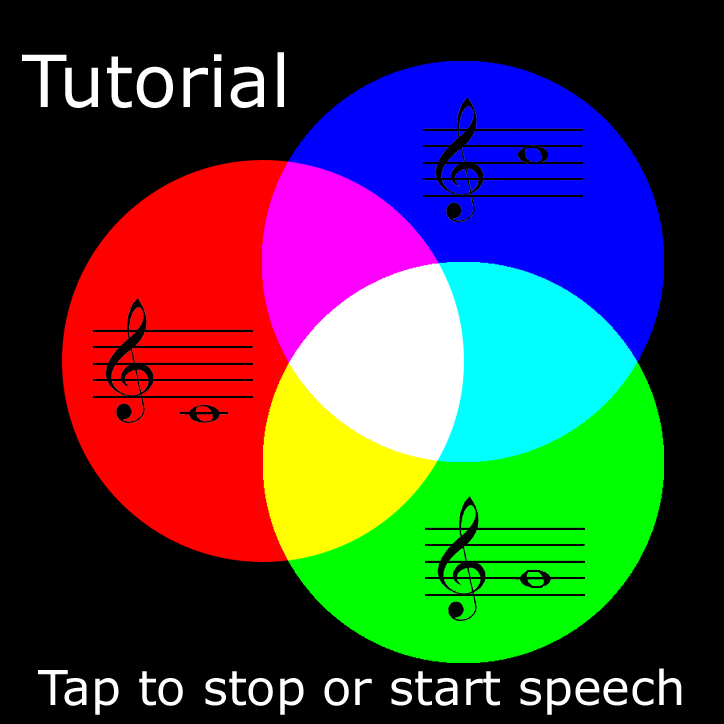 You can restart the vocalization with another quick tap. A quick single finger swipe to the right moves to the next image, while a quick single finger swipe to the left moves to the prior image. If you do a quick single finger swipe down, you will be able to scan through the titles of all of the images by placing your finger on the screen and slowly moving right and left. This may be useful if you return to this section and don't want to go through all the images in sequence again.